I got the idea from Mark Bittman and followed his recipe with some changes. 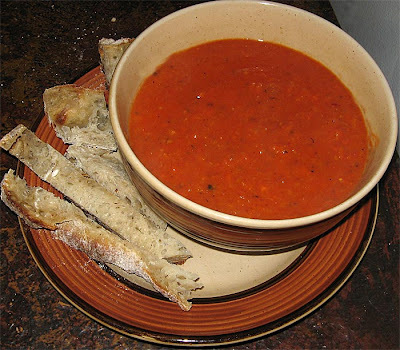 I tripled the garlic, doubled the carrot, added bread (same potato and thyme bread mentioned below), reduced the liquid addition, and in the end pureed the soup. I think the changes were warranted - it turned out flavorful and thicker than his version. Cut the tomatoes in half, put on baking sheet, top with olive oil and thyme, and roast at 375 till the edges start to turn black (Bittman says 30 mins, I put mine in the broiler after 30 mins to finish them off). In saucepan, sautee garlic, onions, and carrot in olive oil for a few minutes, till roughly the onion has cooked through. Add salt, pepper, water, bread, the roasted tomatoes, any liquid that collected in the roasting pan, and the reserved tomato liquid from the can. Raise heat till soup boils, boil one minute, and reduce to a low simmer. I recommend adding more olive oil at this point, it makes for a richer soup, maybe 2 tablespoons. Simmer 20-30 minutes till veg is cooked through.